If someone asked me to name a truly tough film star, I'd never think of naming John Wayne, Kirk Douglas, Arnold Schwarzenegger, Clint Eastwood, Humphrey Bogart, or any of those male performers whose toughness mostly consists of caressing assorted weaponry while posing for the camera. With rare exceptions – Edward G. Robinson's gangsters and James Cagney's psychos come to mind – I've always felt that the toughness of the movie tough guys is merely a façade, a cover for grown men who aren't honest or courageous enough to demonstrate their human vulnerabilities; their feelings of fear, loneliness, sadness, or tenderness. Those heroes can beat up and/or mow down a whole array of film extras dressed as Indians or Nazis, plus supporting players Lee Van Cleef and Richard Jaeckel, but they still come across as weaklings – prisoners unable to escape their own self-imposed stoicism. If those film toughies had to battle the emotional, physical, and social obstacles faced by movie women – problems that aren't solved with big guns, big fists, and big bombs – they'd have run home crying for mama. So, when I think of tough movie stars, whether past or present, I usually think of actresses; women who can, when given the chance, do everything the guys do – without (necessarily) resorting to fists, rifles, shotguns, or automatic weapons to achieve their goal. All the while, they are both honest and courageous enough to show their vulnerable side. Unlike their male counterparts, those women are no poseurs. When I think of toughness in old movies, I think of Barbara Stanwyck and Jean Arthur, Katharine Hepburn and Myrna Loy, Bette Davis and Joan Crawford, Jeanne Moreau and Anna Magnani, Joan Blondell and Ida Lupino, Aline MacMahon and Rosalind Russell, and, of course, Ann Sheridan. Though hardly as well-remembered as Hepburn, Davis, or Crawford, the Texas-born Sheridan (née Clara Lou Sheridan, in Denton, on Feb. 21, 1915) was one of them no-nonsense tough dames that added salt, pepper, and hot mustard to dozens of movies made during the heyday of the Hollywood studios. Following a long apprenticeship during the second half of the 1930s – mostly as an extra and bit player at Paramount, and then in supporting roles and B-movies at Warner Bros. – the versatile Sheridan finally came into her own as a star in a series of 1940s comedies, dramas, and musicals at Warners. Even then, she was never the top star at the studio where Bette Davis ruled supreme. But despite the Davis handicap, Sheridan – labeled The Oomph Girl by some retarded studio publicist – did manage to showcase her considerable acting abilities in a series of productions. Among them were the dark drama They Drive by Night, with George Raft, Ida Lupino, and Humphrey Bogart; the comedy The Man Who Came to Dinner, in which she played opposite a surprisingly subdued Davis; Honeymoon for Three, co-starring with future husband George Brent; Sam Wood's popular, Academy Award-nominated melodrama Kings Row; the musical Shine On Harvest Moon, based on the life of Broadway star Nora Bayes; and The Unfaithful, co-starring with Lew Ayres and Zachary Scott in an updated version of Davis' 1940 success, The Letter. Shortly thereafter, however, her films became mostly routine, though she gave a solid performance opposite Sterling Hayden in the pleasant Take Me to Town. Sheridan was by then in her late 30s, and the studio system was in its last days. Contract players were being let go, old timers – especially women – were being replaced by young faces. Female filmgoers, who had all but million-handedly supported the stardom of most female screen stars from the silent era to the end of World War II were now staying home watching television. Unsurprisingly, like so many other screen veterans Sheridan took the small-screen route. She appeared in a number of TV shows, mostly in anthology episodes but also – in the 1960s – in the long-running soap opera Another World and the comedy Western Pistols 'n' Petticoats. She also worked onstage, including a 1958 presentation (also televised in the United Kingdom) of William Saroyan's The Time of Your Life, opposite Franchot Tone and Dan Dailey. Ann Sheridan died of cancer at the age of 51 in 1967. Author Ray Hagen, who has contributed to film publications such as Films in Review and Screen Facts, has kindly consented to answer a few questions about Ann Sheridan for Alt Film Guide. In Killer Tomatoes: Fifteen Tough Film Dames (McFarland, 2004), which Hagen co-wrote with Laura Wagner, he devotes one chapter to Sheridan, whom he befriended in the 1960s. (Sheridan is the Killer Tomato on the cover.) Additionally, Hagen and Wagner are currently working on an Ann Sheridan biographical project. Anyone with information, leads, or tips on Ann Sheridan, please contact Ray Hagen at hagenray at earthlink dot net or Laura Wagner at whitingfan at yahoo dot com. 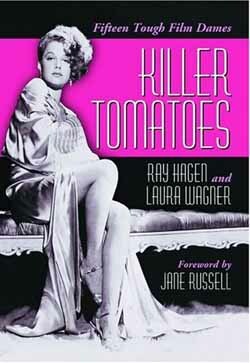 For the record: The 15 Killer Tomatoes are Lucille Ball, Lynn Bari, Joan Blondell, Ann Dvorak, Gloria Grahame, Jean Hagen, Adele Jergens, Ida Lupino, Marilyn Maxwell, Mercedes McCambridge, Jane Russell (who wrote the book's foreword), Ann Sheridan, Barbara Stanwyck, Claire Trevor, and Marie Windsor. You're currently working on a project about actress Ann Sheridan. Why Ann Sheridan? Because she's among the most neglected and unappreciated actresses of her time and I got tired of waiting for someone else to do it. Plus I adored her, on screen and off. Ann Sheridan underwent a long apprenticeship in the 1930s and early 1940s, going from extra to bit player to minor supporting player to major supporting player to lead in B-movies to second lead in A-productions to leading lady to – finally – star. Why did it take her so long to become an established player in Hollywood films? She also correctly noted that “any executive or producer who didn't know me, had never worked with me or seen me work with a good director, would say, 'Oh my God, not a beauty contest winner! Oh, not the Oomph Girl!' Between the two I think it certainly was a hindrance to my getting good parts, or better parts.” Warners mostly gave her junk, but when she got the rare good script she always rose to the occasion. Ann Sheridan was a Warner Bros. star in the 1940s. What was it like for her to work at the studio where Bette Davis ruled supreme? Were there many roles that Sheridan wanted but that ended up being played by Davis or Ida Lupino? Annie hugely admired Bette Davis and never resented her Queen of the Lot position, nor did she consider herself to be in Bette's league. But she was well aware that there was a fierce amount of competition at Warners during her star years there, and it wasn't just Davis. Consider that Sheridan, Davis, Barbara Stanwyck, Joan Crawford, Ida Lupino, Lauren Bacall, Jane Wyman, Olivia de Havilland, Alexis Smith, Geraldine Fitzgerald, and Eleanor Parker were all at Warners at [about] the same time. Competition there was a way of life. The pictures she really wanted to do were made at other studios, and Warners refused to loan her out. Did Ann Sheridan have a favorite film and/or director and/or co-star? How did she get along with her WB co-stars James Cagney, Pat O'Brien, Humphrey Bogart, John Garfield, and Dennis Morgan? In addition to Bette Davis in “The Man Who Came to Dinner”? Her favorite of all her films was definitely Kings Row [above, with Ronald Reagan]. Among her favorite directors she named Norman Taurog [for whom she appeared in bit parts in two 1934 productions, College Rhythm and Mrs. Wiggs of the Cabbage Patch], Sam Wood [who directed her in Kings Row], Mitchell Leisen [for whom she appeared in bit parts in three 1934 productions, Behold My Wife, Bolero, and Murder at the Vanities], Henry Hathaway [for whom she appeared in a bit part in one more 1934 movie, Come on Marines], and Alfred Hitchcock [with whom she never worked]. [She] loved Humphrey Bogart, loved Errol Flynn. Ann Sheridan is outstanding in “I Was a Male War Bride,” directed by Howard Hawks, and co-starring Cary Grant. Why didn't she make more comedies? Why did Ann Sheridan's film career peter out in the 1950s? Because after Warners, when she was freelancing, she committed the one sin Hollywood could never forgive actresses for – she turned 40. And there was an entire generation of younger stars by then. All the stars who began in the 1930s had a rough time in the 50s. It's still true today. Ann Sheridan did quite a bit of TV work in the 1950s and 1960s. What was that like? Did she also appear onstage? On-screen, Ann Sheridan was humorous, warm, decisive, smart. What sort of person was the off-screen Ann Sheridan? My parents lived on Sheridan Road in Chicago and so, I was attracted to Ann's last name and have seen many of her movies on TCM. I've become a fan and love her toughness and fast talking in the films of the 1940s. In Juke Girl she brushed off a pickup artist with “I never for get a face but in your case I'll make an exception”. I thought that was a great line and indicative of the type of self reliant woman she generally portrayed. She was also a fine actress and was terrific in Kings Row….which I watched this evening….prompting me to find out more about Ann….which led me here. I think she may still be under-appreciated as an actress given the wealth of talent in the 40s, but I like her movies a lot and think she was just as good or better than the top female stars of her day. Besides that she was really attractive. Old time radio had a Burns& Allen show from the 40's. She was the guest star and references were made to her as the “oomph girl”. It's been very interesting to read about her history. I knew the name , but not the history. Thanks for this blog post about Ann Sheridan. I have recently re-discovered the work of Ms Sheridan and am working my way through as much of her filmography as I can. She was a really solid, consistently-good actor. I am the only surviving relative …. granddaughter…..of. Ann Sheridan. Grammy had a son Richard in her early 20s but put him up for adoption and never saw him again. My mother was born out of wedlock. I know who my grandpa is but it was grammys last request…..before her death….to keep his name private. Grammy adopted me at 2 and raised me until her death. She was a beautiful talented actress who did not get the recognition she deserved. I my book she was one of the greatist stars that gave me the impression that she had a great personality, Paul Goehring. P.S. And was a very attractive women. 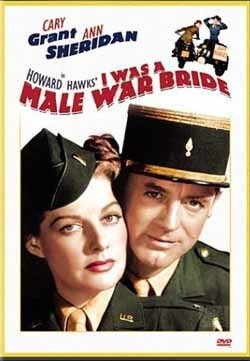 Until recently, the only 2 Ann Sheridan films with which I was familiar were Kings Row & I Was a Male War Bride. I am now semi-retired and have time to renew my interest in old movies from the 1930s and 1940s. This lead to my “re-discovering” Ann Sheridan and many more of her movies. I enjoy finding what info I can on the internet about her. Thanks for this blog post (I know it's from a few years ago). Did Ann have any children? Did Ann Sheridan have any children? She was my Great Aunt. My paternal grandmother's sister. What a Great Website. I enjoyed reading and looking at the pictures! Ever since I first saw “Angels With Dirty Faces” she has been my favorite actress. Recently I was in a Hollywood bookstore and asked about any books (biographies) on Ann Sheridan. Thay said they knew of none and they were as disappointed as me. I am so glad to hear a project on her is underway. I can't wait for the book to come out. She was beautiful, vivacious, and charming on screen; thanks for giving us some insight on her off camera. It is so nice to here she was exactly like I thought she would be! I often wondered why she was not a bigger star….I loved her in Nora Prentice. ..she was spectacular! !! 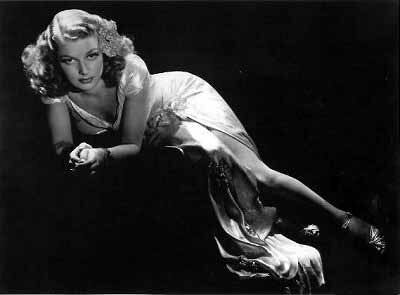 Since childhood, I have been told that Ann Sheridan is my second or third cousin on my father's side of the family. My dad's name is LeRoy Williams Warner. Do you have any family history relating to Ann Sheridan's family tree? Thank you. I am so glad to find this bio on Ann. My brother was crazy about her, he had her pic on his wall. I loved her in Kings Row, thats where it all began for me. A beautiful full rich speaking voice. It's always a man that does narration's of films,she could have done this very well. To me her charm, sophistication, directness, and beauty were her trademark, and your right she was much negelected in Hollywood. Any info when the book will be completed? I am sitting here humming Angels in Disguise all day long because of Ann in the movie “It All Came True..” I think she is so under appreciated and thanks to TCM for keeping her alive 42 years to the day after her death. Just discovered your website; what a great find! Keep up the good work! Great to hear about her upcoming biography…Can't wait for it…she is my favorite of all the actresses of that time. I enjoyed reading the article on Ann Sheridan. I posted a bit about her on my latest blog entry about the 'Over 40' crowd in Hollywood.